The recipient for the 2018-20 ANS/AAO-HNSF Herbert Silverstein Otology and Neurotology Research Award has been selected. Elliott D. Kozin, MD is the Neskey-Coghlan Neurotology Fellow at Harvard Medical School / Massachusetts Eye and Ear in Boston, MA. Dr. Kozin’s clinical and research training occurred at the University of Pennsylvania, National Institutes of Health, and Harvard Medical School. He has a broad research training in a variety of disciplines, including wound healing, auditory neuroprosthetics, and clinical otology/neurotology. Dr. Kozin currently leads a multi-institutional team investigating relationship between head injury and audiovestibular dysfunction. Next funding cycle in 2020, letter of intent due November 2019. Please click here for submission instructions! 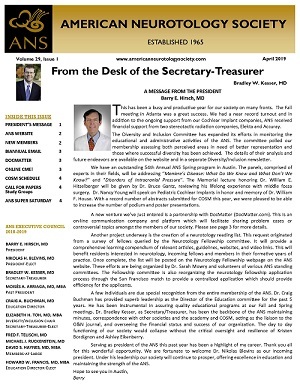 The purpose of this award, which is jointly sponsored by the AAO-HNS Foundation and the ANS, is to support a clinical or translational research project focused on diseases, disorders, or conditions of the peripheral or central auditory and/or vestibular system among new full-time academic surgeons. The award is intended as a preliminary step in clinical investigator career development and is expected to facilitate the recipient's preparation of a more comprehensive individualized research plan suitable for submission to the National Institutes of Health or comparable funding agency. $25,000, non-renewable, one to two years to complete project. Please visit the CORE grant home page for additional information.